First complete this Microscope pre-lab (video & virtual microscope) before continuing on. 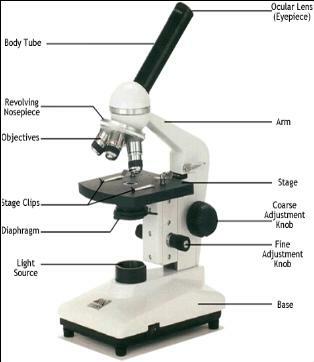 List all the parts of a compound microscope and give the function of each part. Summarize the differences between our microscope and the virtual microscope (use the picture on this page). Number and summarize the correct steps from start to finish used to focus an object at 400x. A compound microscope is an expensive precision instrument that requires special care and handling. In this activity, you will learn the parts of a compound microscope, the function of each part, and the proper care and use of the microscope. Always carry the microscope with both hands. Grasp the arm of the microscope with one hand and place your other hand under the base. Place the microscope at least 10 cm from the edge, with the arm facing you. Observe the numbers etched on the objectives (Example: DIN 4) and on the ocular (W10XD). The TOTAL magnification is found by multiplying the magnification of the objective by the magnification of the ocular. EXAMPLE: If the magnification of the object was DIN 20 and the ocular was W10XD, the total magnification would be 20 X 10 = 200 X. In other words, the specimen seen through the microscope would be 200 times larger the viewed with the naked eye. Complete the data table on your answer sheet to find the total magnifications of each objective on our microscopes. Lens Paper should be used to clean any of the lenses of the microscope. Lens paper is provided to you by your instructor. Never use anything other then lens paper to clean the lens on the microscope, including your fingers. After you plug the microscope in and turn on the illuminator, rotate the Iris diaphragm on the underside of the stage in order to adjust the light intensity. Look through the microscope as you adjust the diaphragm and observe the changes. Set the diaphragm and move on. Keeping the light intensity in mind, look through the microscope and move through the different magnifications slowly. Observe the change in light intensity. Adjust the intensity of light to match the requirements of the objective you are wishing to view. Position the 4X objective lens into the optical path, making sure that the lens clicks into position. Look at the microscope with your head to the side. Locate the coarse adjustment knob which moves the stage up and down. Practice moving the coarse adjustment knob, seeing how it moves the stage with each turn of the knob. Using the coarse adjustment knob, move the stage down as far as it will go. This is the starting position when you first begin to bring an object into focus. Look into the eyepiece. Slowly, move the stage up by using the coarse adjustment knob until it comes into focus. Never allow the slide to come in contact with the objective lens. Turn the fine adjustment knob to bring the specimen into sharp focus. You may need to change the aperture (opening) of the iris diaphragm to control the brightness. It depends on the specimen and the magnification you are using. Rotate the revolving nosepiece to position 10X objective into the optical path. Use ONLY the fine adjustment knob to bring the image into sharp focus. Rotate the revolving nosepiece to position 40X objective into the optical path. Use ONLY the fine adjustment knob to bring the image into sharp focus. **** NEVER use the coarse adjustment when focusing on the medium and high power objectives!!!!! Using a pair of scissors cut a small letter “e” from a piece of newspaper. Cut the smallest letter “e” you can find. Position the letter “e” on the center of a clean microscope slide. Using a dropper, place a drop of water on the piece of newspaper. Hold a clean cover slip in a vertical position (90 degree angle) next to the water. Make sure the bottom edge of the cover slip is in the drop of water on ones side. Lower the cover slip “rolling” it down, to avoid trapping air bubbles between the cover slip and the slide. Make sure the bottom of the slide is dry before you place it on the stage of your microscope. Center the wet-mount of the letter “e” on the stage with the “e” in its normal upright position. Bring the letter in to focus under low power using the procedures you learned in number 6 above. Note the position of the letter “e” on the slide (using your eyes only) and as seen through the eyepiece of the microscope. Draw the letter “e” as seen through the microscope on the observation sheet (letter A). Be sure to record the magnification. While looking through the microscope, move the slide to the left, notice which way the letter “e” moved. Now move the slide to the right. Notice which way the letter “e” moved. Do the same with moving the slide away and towards you. Turn the medium power objective into position and bring the letter “e” into focus using what you learned in number 7 above. Draw the letter as seen through the microscope on your observation sheet (letter B). Don’t forget to record the total magnification. Looking at the side, rotate the high power objective into position. Bring it into focus using the fine adjustment knob ONLY. (if you lose the object, start again from number 6 above) Draw the letter “e” as it appears in the microscope on your observation sheet (letter C) and record the magnification. Remove the slide and clean of the letter “e” You will use this slide again in the next step. Cut a small piece of a colored picture from a magazine (red, blue, yellow, orange, etc). Prepare a wet mount slide of the colored object using the slide from the previous section. Bring the colored picture into focus under low power, then medium power, then high power. Compare the appearance of the photograph (piece of color picture from a magazine) you observe with the naked eye to the way it appeared when you observed it using the microscope. Relate this observation to the concept of improved resolution. (the ability to pull out tiny details). Using high power, make a colored drawing of your object on the observation sheet (letter D). Remember to include magnification and specimen.